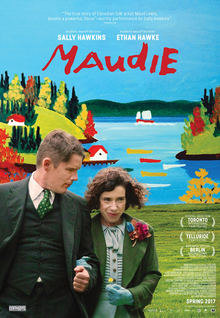 First Maudie is an opportunity for a tour de force performance from Sally Hawkins. Director Aisling Walsh focuses her camera on two things, her lead actor doing a knock it out of the park performance which highlights the strength of a woman many may not see as strong, and two on the beauty of eastern Canada and all the magic that entails. By doing both she creates something truly watchable, captivating. This story of Canadian painter Maud Lewis doesnot focus on her disability or her rise to fame. Instead it focuses on her struggles with a community that doesn't see value in her. Hawkins and Walsh spend their efforts on showing the woman's strengths and remarkable resiliency. Her detractors are always forced to confront their own betrayal of her and her journey is one of joy and success in spite of what she encounters. My only problem with the film is the way it romanticizes what is presented as a borderline abusive relationship. I get that it's showing both her resiliency and defiance as well as the journey of her husband inspired by her, but his love for her is often ugly and I felt the film softened the effects of that for the sake of the ending. The film gives her justice in her other abusive relationships but here she shows the forgiveness of a deity. Yes Ethan Hawke is remarkable in this role, in one of his rare chances to not just play Ethan Hawke like he usually does. But his character is cruel and we are asked almost too easily to forgive him. Perhaps this is because she does, the real Maud Lewis. And perhaps that is good enough for us her audience. Walsh lovingly and artfully exploits her setting (Newfoundland standing in for Nova Scotia - heresy?) creating that kind of love of the area that those who live there experience. Maud captures that beauty in her work and the film does too in its own way. Maudie is a lovely little thing of beauty.